Batman The Escape (previously known as Shockwave) was a steel stand-up roller coaster which operated at three Six Flags parks. The roller coaster was designed by Intamin and manufactured by Giovanola. It is currently dismantled and will not operate again. Shockwave opened at Six Flags Magic Mountain in 1986, on the spot where Sarajevo Bobsleds stood for the previous two seasons. It was painted entirely black. Like Sarajevo Bobsleds and several other Six Flags roller coasters at the time, Shockwave only operated briefly, lasting three seasons before being dismantled to be sent to another Six Flags park. It was replaced by Psyclone which in turn was replaced by Apocalypse. The commercial for this ride said "If you think you can take it... Stand up." And lo and behold, there were no seats on the coaster! In 1989 land clearing began at Six Flags Great Adventure in New Jersey and towards the end of summer parts began arriving. 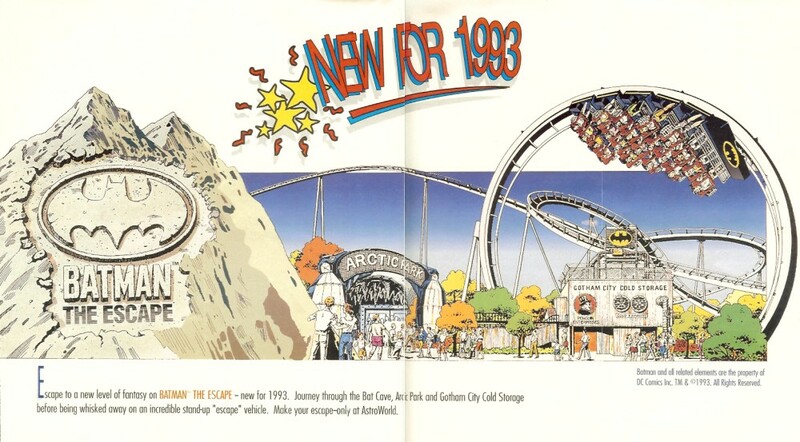 Meanwhile, a competition was held asking guests to "Stand Up and Name It", with the winning contestant receiving a $250 premium bond, a family season pass for 1990 and an invitation for the ride's media day. In the end, the roller coaster was called Shockwave, the same name it operated under at Magic Mountain. Shockwave had a press preview on April 20, 1990 and opened to the public the following day. It was painted blue with white supports. It was dismantled in the 1993, after operating for three seasons, with the plot left vacant. Another stand-up roller coaster, Green Lantern, opened at Great Adventure in 2011 on the plot previously occupied by Great American Scream Machine. The roller coaster opened at Six Flags AstroWorld in 1993. It was painted entirely white and called Batman The Escape. This was the second or third Batman/DC coaster to open at a Six Flags park, and the first not to be called Batman: The Ride. It was later painted yellow with black supports. It closed with the park on October 30, 2005 and was subsequently dismantled. Six Flags placed the roller coaster at Darien Lake in New York State, which it owned at the time. However shortly after, Six Flags announced plans to sell Darien Lake, and the park was acquired by PARC Management in 2007. While it remains in storage outside in a field opposite the park, many mechanical components are missing. In 2017, the general manager at the time said there are no plans to erect the roller coaster and it will be scrapped in the future. The ride had a curved first drop which led immediately into the 66 foot tall vertical loop. This was followed by a twist reminiscent of an inclined loop and a rise into the mid-course brake run. The second half of the ride had more twists and turns, with the track passing through the center of the vertical loop. Shockwave did not have a theme when it operated at Magic Mountain and Great Adventure. While at AstroWorld, the roller coaster was based on Gotham City. Guests journey through Arctic Park and Gotham City Cold Storage before boarding the roller coaster to make their escape. Of course, with Batman Returns out at the time, the villain in this ride was The Penguin. 2 trains with 5 cars per train. In each car, riders are arranged 4 across in a single row for a total of 20 riders per train. Batman The Escape on the Roller Coaster DataBase. From Coasterpedia, The Roller Coaster Wiki - 2,506 articles since August 2009. This page was last modified on 13 February 2019, at 10:42.